After mating, the offspring starts to grow. In some animals, the offspring grows in an egg outside the mother. 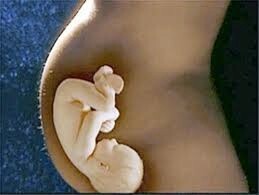 In other animals the offspring grows inside the mother's womb. Oviparous: the offspring grows inside an egg, laid by the mother. Examples: birds and insects. Viviparous: the offspring grows inside the mother's womb. Examples: humans and other mammals.